All that has to do with the power train, gearbox, clutch, fuels and lubricants, etc. Generally the mechanical side of Formula One. That Delage engine is a work of art. Are those scraping marks on the block? If you are referring to those ‘DOT’ like marks/indentations on the flat surface of lower of Delage block and sump castings, no they are not scraping marks. Scraping is only carried out on two mating surfaces that are intended to work together. Last edited by Tommy Cookers on Sun Dec 02, 2018 11:12 pm, edited 1 time in total. When ever I see the old style race car, the brakes, tyres steering, it reminds mo of a verse from Kiplin. We can neither love nor pity nor forgive. If you make a slip in handling us you die! " Power and beauty, but one slip and.."Our touch can alter all created things,"
Also, suprised to see the constant depression carb, I thought it was too early for that. That Delage is quite impressive! Thanks SS for these and more to come. 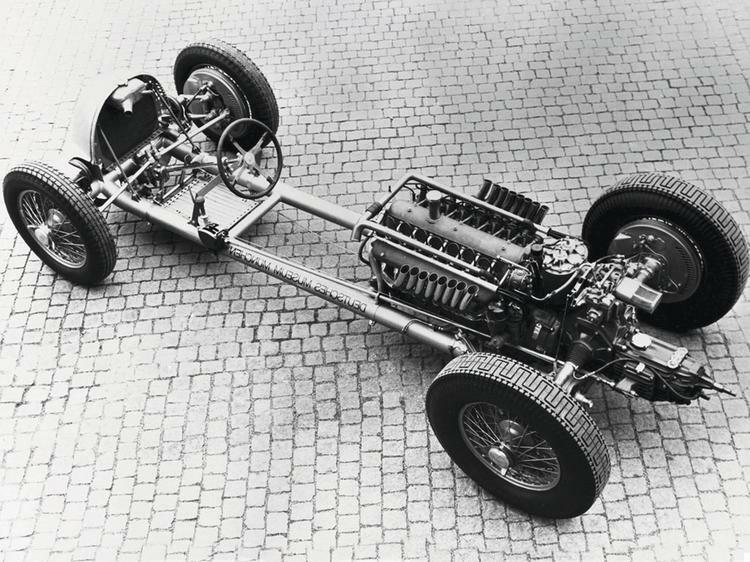 1932 Alfa Romeo tipo B 2.7-litre eight: Single aluminum monobloc casting that unified 2 cylinder heads and 2 4-cylinder blocks that extended upwards to carry the twin overhead camshafts. Resting on a common aluminum crankcase, the cylinder walls were formed by dry steel liners which were inserted from the bottom and shrunk into position and clamped by a small flange against the top of the crankcase. The crankshaft was made as 2 separate 4 cylinder parts united at the center by a pair of gears, one of the gears drove the camshafts through a gear train while the other drove the supercharger and the oil and water pumps. This center type of drive eliminated torsional vibrations. 2 valves per cylinder were equally inclined at 52 degrees from vertical. 18mm plugs were used placed vertically at the center of the chamber and firing through masking aperture. All valves seated directly on the head. 3 springs closed each valve, a screwed cap onto the valve stem with matching serrations on the spring retainer was screwed in or out for valve adjustment. A central gear were bolted to separate camshafts for each bank each cam running on 3 plain bearings. The central drive train spur gears ran on ball bearings. From the left side of the block a gear train from the crank center drove a pair of 2-lobe roots type superchargers, one for each set of 4 cylinders, each had a rotor 90mm long and a capacity of 1350cc. Driven at 1.45 times engine speed (the ratio could be changed) the 2 superchargers produced a boost pressure of 11psi. Underneath each blower was its own 42mm updraught Weber carburetor (BS42). Aluminum pistons with 3 compression and 1 oil ring above the gudgeon pin and 1 oil ring bellow it were used. A steel 2 bolt cap con-rod with 18mm gudgeon in a bronze bush was used. 10 babbit main bearings with caps tightened by 2 studs against the bottom of the magnesium crankcase which was split at crank centerline. Dry sump by scavenge and pressure gear oil pumps. Inlet opens 20 degrees BTDC. Inlet closes 50 degrees ABDC. Exhaust opens 50 degrees BBDC. Exhaust closes 20 degrees ATDC. Peak power 215 BHP@5600 RPM. Piston speed corrected 14.8 m/s. BHP per litre 81 BHP/Litre. ...not because they are easy, but because they are hard! Some links about the 1932 Alfa Romeo tipo B 2.7-litre eight. I am not 100% about the images for this one, there seem to be slightly different variants around, so please correct any errors below or by PM! There was different variants of both cars and engine as both are developed over years/seasons. The excellent picture/photo is in my opinion of a 1931 Jano’s back than introduced new creation the 8C 2300, It had the same basic straight eight engine of the 1932 tipo B which was enlarged to 2.7-litres. The engine is clearly and Easley recognized by its distinguished central crankshaft drive dividing the engine into 2 four cylinder blocks. I know that some people looks at a scraped working surface they have scraped with pride and as a sign of beauty in their workmanship. I know because I done and still do some scraping myself. Some might even scrape a non-functional surface to show-off. But back to that fine photo showing one of the finest and most beautiful engines ever made, the 1927 Delage 15-S-8 1.5-litre eight, what you see on the lower and upper crankcase are not scraping marks. 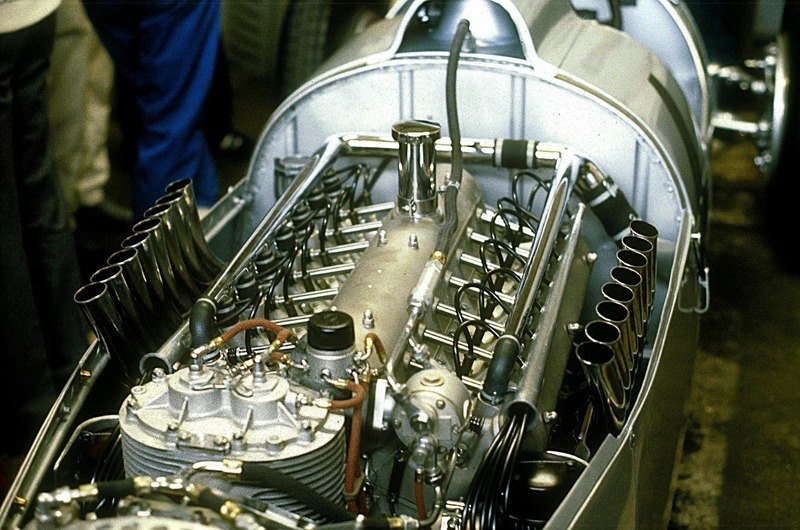 1936 Auto Union C-type 6 litre V16. Used from 1934 to 1937 was an amazing and magnificent achievement. 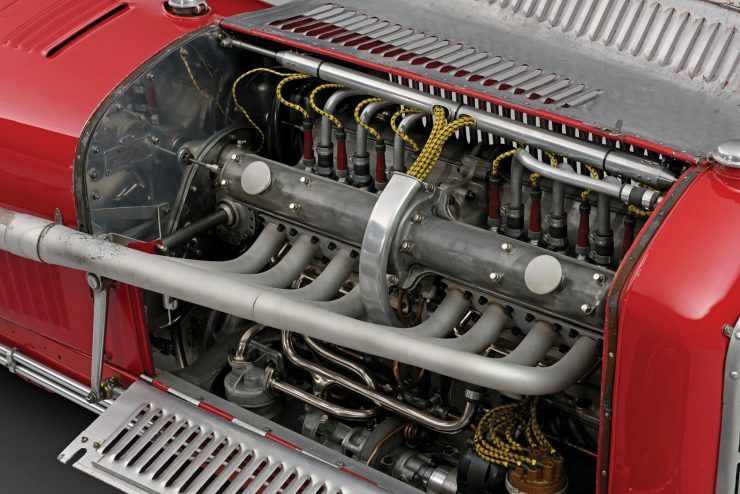 Among the most brilliant, the only 16-cylinder ever to achieve consistent success. By Dr.Eng. Ferdinand Porsche and designer Josef Kales. High power through high torque at low crank speeds. Lower structural stresses allowed the block and crankcase to be cast in one piece in thin wall high-silicon-alloy aluminum. Inserted were forged chrome-alloy-steel cylinder liners exposed to cooling water. Detachable cylinder heads were used, studs retaining the heads were long, extending well down into the block. Cylinder banks at 45 degrees and valves disposed at 90 degrees to each other, single 18mm spark-plug was used. A masterful arrangement of valve gear and induction, only one single central overhead camshaft was used, rotating in 9 bearings and containing 32 lobes, opened the inlet valves directly through fingers on parallel shafts, the outboard exhaust valves were opened remotely through finger followers which operated rocker arms at the exhaust valves through horizontal push-rods. The major accessory drives were at rear of engine, taken from crank between ninth and tenth main bearings. Bevel gear drive vertical shaft from crankshaft drove the camshaft. Side bevel gears from this shaft drove the twin eight cylinder Bosch magnetos. Above them a multi-disc clutch pack drove the primary lobe of a vertical roots supercharger delivering 2.8 litres per revolution rotating more than twice engine speed with a boost of 9psi. Blower was offset to left so its output could be ducted around the vertical shaft to the center inlet passage. With surpassing genius it was arranged for the inner surface of the heads covered by aluminum casting of cam-housing to enclose a volume that served as inlet manifold. The bottom of crankcase was at an angle as viewed from the side, at the rear it reached all the way down to the bottom of clutch/flywheel assemble. At the rear twin gear-type oil pump rotating at 5 times engine speed, 1 was scavenge the other a pressure pump. The exhaust manifold collected 2 cylinders at a time (4 exhaust pipes on each side). Forged chrome-nickel-steel crankshaft in tin-bronze bearings shells, similar bearings for con-rods, an external tube from big-end to gudgeon pin carried oil to pin. Pins retained by aluminum buttons. A Solex 2 float chambers twin-throat 48mm carburetor was used. The car nicknamed “A big car in miniature”. The engine: T.Murray Jamieson previously of supercharger makers Villiers who had a dream of an engine rotating at 12-14k RPM was instructed to design and build the best possible 750cc race engine. A 4 cylinder in line with inverted-cup-type tappets of 53.3mm diameter, drilled around its skirt for lightness had a large coil spring beneath its periphery to keep the tappet in contact with cam-lobe, the lobes were 2 inches wide. The valve itself was seated by 2 coil springs with the combined force of the 3 springs at lift of 500lbs. The same size 2 valves per cylinder were used. They were equally inclined at included angle of 100 degrees from center line seating on inserts of Monel metal in an RR50 aluminum cylinder head. The block/crankcase also of RR50 aluminum extended to the bottom of the engine. A cast finned sump for dry-sump oiling system closed the bottom. Accessories were driven from rear of engine, gears out of each side with shafts going forward, the left drove a large water pump at half engine speed, a skew gear on the pump shaft was the access point for starting crank inserted at the side. The shaft on the right side drove the 12k RPM tachometer and also a stake of oil pumps. A scavenge pump at bottom and above a 100 psi pressure pump for the bottom end, also a 10psi pump oiling the valve gear, the shaft also drove a magneto. The gear train continued to top to drive the camshafts each of which rotated in 3 bearings. Tapped from the rear of the gear train was a drive to a roots type supercharger driven at 1.5 times engine speed. The supercharger was sized to provide a boost of 22psi; its output was supplied through a finned cast light-alloy pipe with a blow-off valve on it, to a finned manifold mated with the head porting. A single SU carburetor was used. After piston-crown failures were encountered a 2nd float bowl was added to the carburetor. The machined from solid 3 main bearing crankshaft had a plain lead-bronze center main, while the other 2 mains were roller bearings. Rod bearings were plain white-metal bearings. An oil feed to the bearings through the nose of the crank was used. 2 bolt big-end caps were used. Slipper-type pistons with 2 compression rings and 1 oil ring were used. A wet nitride steel cylinder liner hung free at bottom with rubber seal to block. 4 studs per cylinder tied the head to the block. Stroke 65.1mm. Stroke/bore ratio 1.08:1. BHP per litre 155.9 BHP per litre. 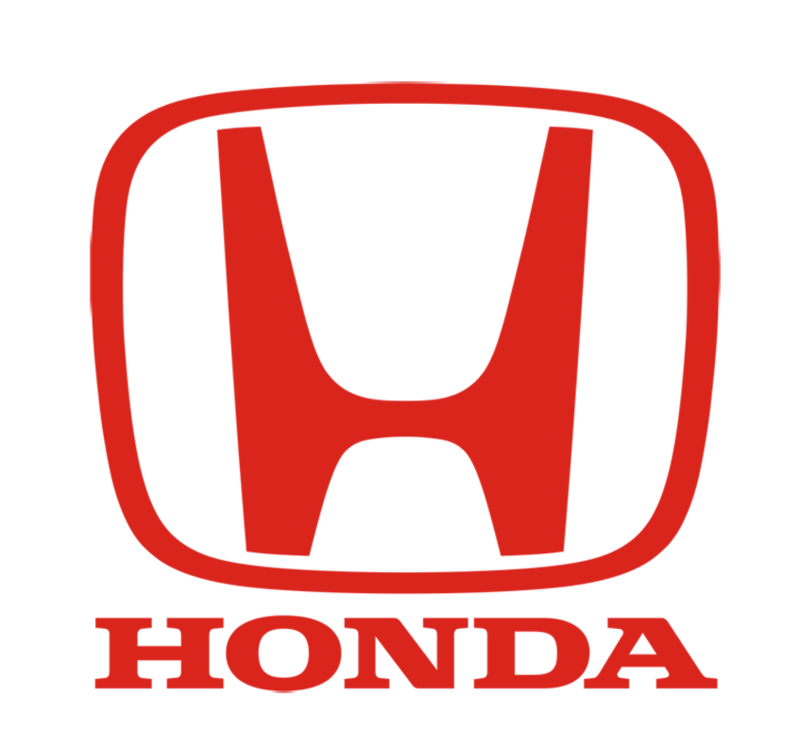 Engine weight per BHP 1.01kg per BHP.